Mom's Dead Upset is about a middle-class family of three generations that run a laundromat. The mother of the family, played by actress Kim Hye-ja, has planned out the lives of her three children her whole life. However, all three end up with partners that don't quite suit their mother's taste. 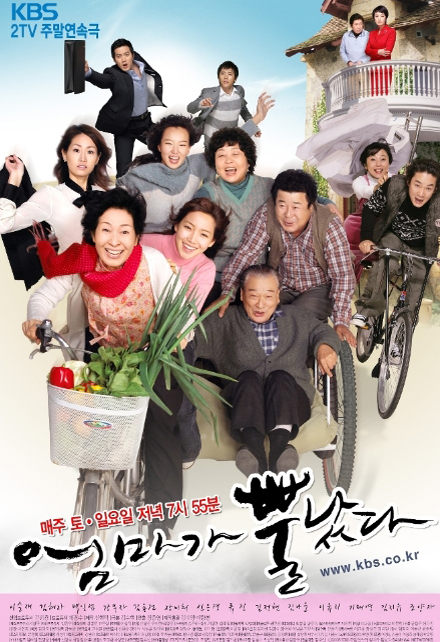 The drama features realistic and witty conversations, typical of Kim's works, as well as superb acting by some of Korea's top actors. Haddy M Jun 06 2012 9:08 pm I didn't see the ending of this show. I used to see it during night time on Sunday, and then it changed to Saturday and Sunday afternoon, but now it never showed. What happened to the ending of this drama? Can you do a rerun again? FableCat Mar 31 2012 8:41 pm Waaaaaa T_T.. KBS changed slot.. It was supposed to be two episode on sunday night after gwangaetto conquerer.... Now I can't see it because it changed slot on the afternoon on Sat and Sun and I am at work at that time.. Not fair T_T..... Any Malaysian know when they do rerun.. cause I definitely can't watch them on the afternoon..